I haven’t updated my blog in a LONG time, but I am still riding! Somehow life and work have kept me busy. Imagine that. It occurred to me that I have received more comments on my how-to article on Euro gears for the Vulcan 2000 than all other posts combined! It was a fun modification to do and a fun project to document. I’m glad that many have found it helpful. 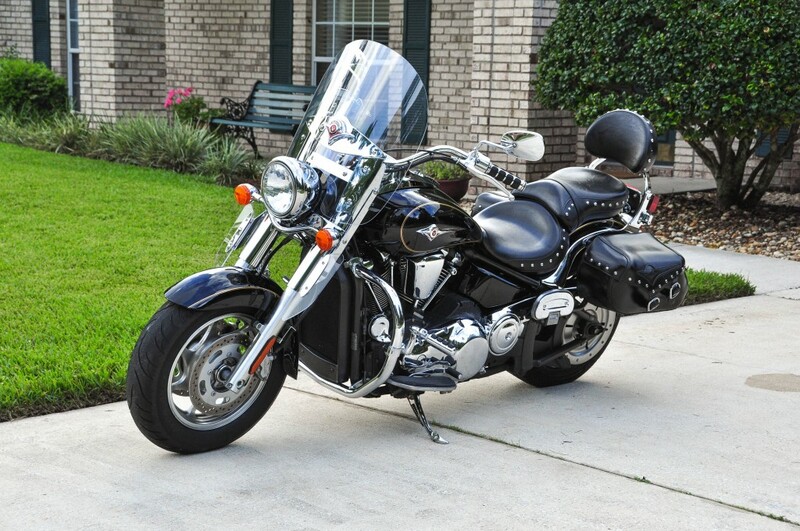 I have sold my Vulcan 2000 Classic LT and replaced it with a 2014 Goldwing Level 3. I owned the Rogue for 7 years and for the first 5 I absolutely loved it. Tremendous power, stable on the highway and super reliable. But over time I realized that I really wanted the features and comforts of a touring bike. 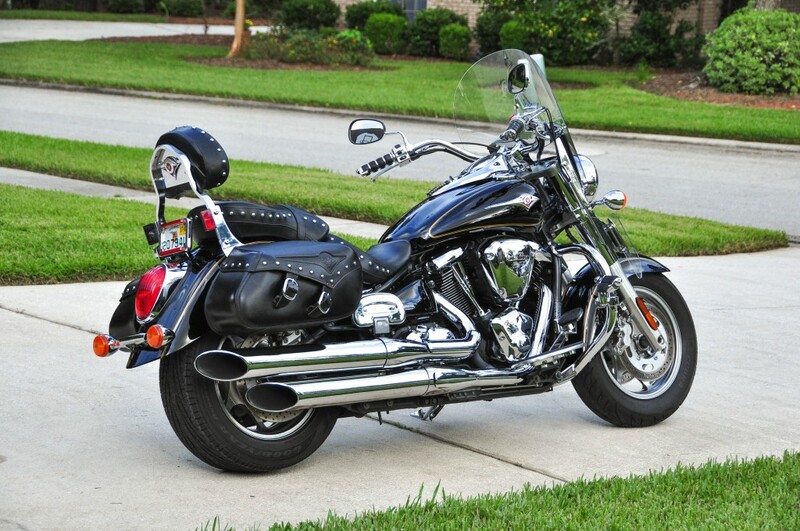 I considered upgrading the bike, but even if I had added hard bags, a better seat, suspension upgrades and more, I would still be left with a cruiser. The Rogue is an awesome bike and I loved the motor, but as time went on, the negatives outweighed the positives. The ‘Wing had everything that I wanted and more. Finally some thoughts on riding on the Dark Side for 5 years. I installed a Goodyear Assurance Triple Tread. The tire cost half as much as a MC tire and lasted 4x as long. That’s an 8x price performance improvement. In dry or wet weather, the bike was absolutely glued to the road. Over the years, I pulled 3 nails and screws out of that tire, objects that would have certainly punctured a MC tire. Yes, you had to counter-steer more to get the bike to turn, but it wasn’t objectionable (at least to me it wasn’t). The Rogue doesn’t have a lot of ground clearance anyway, so even leaned over and scraping the floorboards I always had half the tread on the ground. I rode Deals Gap several times on the Dark Side and I can attest that the hysteria surrounding car tires is complete nonsense. A visual inspection of the tires proved that the tire never rode on the sidewalls (and there are plenty of videos on the web that prove this as well). The only aspect of the Dark Side that I did not like was the tendency for the bike to track to the lowest spot in the road. E.g., on a road where heavy trucks had created depressions in the roadway surface, the bike always wanted to seek the lowest spot. Other than that, I see no drawback to the Dark Side. Everyone has their opinion – all I have to say is try it, you might like it. Will I return to the Dark Side with the Goldwing? I’m not sure – I am enjoying the incredible handling of the Goldwing so much that I may or may not. So goodbye to the Rogue community. Enjoy your ride and be safe. Despite the massive amounts of torque available on the VN2000, the engineers at Kawasaki chose to put some steep gearing in the bike. The net result is that you need to shift out of first gear almost immediately after starting up. Heck, there isn’t even a need for first gear. You can easily start in second. Additionally, this means that at highway speeds, you are often tempted to shift into the non-existent 6th gear because the engine is turning so fast. The gearing on the models sold in Europe however have gearing that is not quite as steep as the ones sold in the US. That’s when the realization slowly hits them. ROG members know what a Rogue is, but no one else does. If you could name it, what would you name it?